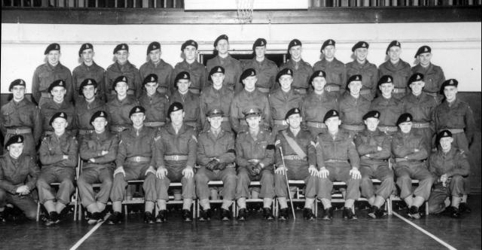 I started my National Service on the 6th of March 1952 in the Duke of Wellington’s Regiment. I was told to report to the depot at Halifax on the day above by 4pm. On arriving at Halifax railway station I saw a big notice saying ‘All recruits wait here’. I stood by the notice and after a short while an NCO appeared, took me outside, put me in a 3 tonner and set off for the barracks. On the way we stopped at a pub and had a pint. On arriving at the barracks we got kitted out. My first meal was pork pie, mashed potatoes and peas. The next morning our Platoon Sgt came in and he turned out to be a bully. One lad who shall remain nameless was made to stand at the side of the square and every 15 minutes shout “I have dirty flesh Sergeant.” Just because the Sergeant said he had not washed his ears. They took us on the rifle range on Hawksworth Moor and when it was my turn to shoot, the Sgt said I had missed the target and killed a little old lady shopping on Ilkley High Street. Also I played rugby with Leeds under 18’s and I used to get telegrams to go play. The Sgt did not like this and never gave me the telegram in my hand but threw it on the floor so I had to pick it up. After basic training all the recruits who would be 19 yrs old by October went to the battalion in Germany. The rest of us went to Fulford Road Barracks in York, for training for the Far East. Whilst at York Geordie Duncan and I went out for a drink, on reporting back to the Guardroom the Orderly Officer was standing there in full dress. Geordie Duncan said to him “What band are you in mate?”. The Guardroom door opened, and as quick as a flash Geordie was dragged inside. He got 3 days jankers for that episode. I went on a scheme against the Brigade of Guards on Fylingdale Moors and later went back on those moors to do live firing, one of the lad’s sten gun went off by accident and shot Lt Cherrington through the leg. While at York I was charged with a frivolous complaint and made to scrub the Company Office floor for 5 nights. Just as I had finished on the first night the Sgt Major came in and said, “Have you finished?” I said “yes”. He walked on the floor and said, “If you have finished what are those feet marks doing on the floor? Scrub it again.” On the fifth night just as I was going to scrub the floor the Sgt Major appeared and said, “Leave it and get off.” The Archbishop of York came and conducted a service in the barracks church. It took us all our time to keep awake. Field Marshal Sir William Slim came and we showed him how good we were on the assault course and the range. I don’t think he would have been impressed with us after being in command of the Fourteenth Army in Burma during the war. I finished training at York and went on two weeks embarkation leave. I went back to York and then by troop train to London, on the underground to another station where we were kept well away from the public, and then to Southampton. Arriving at the dock side, I got a cup of tea and a bun off the WVS then boarded the Empire Orwell for Hong Kong stopping at Port Said, Aden, Colombo, Singapore then Hong Kong. It was a right eye-opener this journey for the lads from Yorkshire. We were attached to ‘D’ Company of the Wiltshire Regiment. I was sent to Se-kon Battle School for 2 weeks with ‘D’ Company. We used to patrol the border with Communist China. While stationed with ‘D’ Company at Bees Stables Johnny Waite and I were sent back to Se-kon Battle School on a 2 week 3” mortar course, I came top of the course and never fired another mortar again. While at the Battle School, we were walking over the hill, to swim in the sea, and we thought we had witnessed a murder. We saw two Chinese men snapping flesh off the bones of a dead body. On reporting this to the officer he said it was a Chinese custom. They put the dead bones in a large earthenware jar and take it to a family vault where they let firecrackers off every anniversary. In Hong Kong I got 7 days jankers for losing my pay book, which had been stolen. At the end of my 7 days jankers me and my mates got drunk in the Naafi. On taking me back to the barracks and putting me to bed under the mozzie net I said I was like a ‘lion in a cage’ and jumped out of bed and ran out of the barrack room with no clothes on. The rest of them chased me, put me back to bed and laid on me until I went to sleep or passed out. I knew nothing till the next morning. It was my first, and last, streak. It was an offence to go out after tea with your arms and legs uncovered because of malaria. We also took one paladrine tablet every day. At the Battle School we were allowed to go to Kowloon or Hong Kong on Saturday or Sunday. It cost 1/6d in the passion wagon. 1st of December 1952 we went down to Hong Kong and boarded the Empire Hallidale bound for Kure in Japan. On the 2nd of December 1952 it was my 19th birthday. After 5 days we arrived in Kure Japan. We stayed there four days, getting winter kit for Korea and zeroing our rifles in. We sailed overnight on the ‘E Sang’ for Pusan in Korea, where we got on a train to Tockchon, then a wagon to the Battalion. I was 19 years and 10 days old. On arriving at the Battalion HQ a Sgt, or a CSM, said “What have you lot come for we don’t want you and you are not on ration strength”. They found us a tent to sleep in and gave us some tinned food, there were ten of us. Next morning we lined up and were told which rifle coy we were going to. I was sent to C Company, where I spent the rest of my service. When I got to ‘C’ Coy HQ I met the Company Commander Major Kavanagh who told me I was to be the Coy Runner, the position I held from the 12th of December to February. The first night I was told to dig myself a ‘hoochie’, I was digging this in the dark, by myself, at 20° F below zero, when the Coy Commander’s batman came and gave me a plate full of dinner. His name was Eddie Cantrell, he was the only person I saw all night. Things were very quiet on that position on Christmas Day. The Chinese told us they would leave us in peace for the day. A British light aircraft flew over and dropped newspapers and cigs. In between Christmas Day and New Years Day we went farther up the front line and changed positions with ‘A’ Company. During one night I was to take a message to 8 Platoon over the other side of the valley, I was told to take John Burke with me as the Chinese infiltrated the valley at night. We got there and back without any incident. On reporting to Major Kavanagh he said, “Everything alright?” I said, “yes”, Johnny Burke said “No Bob’s mad he has just walked straight through a minefield”, I was told I was lucky because they were anti-tank mines and I was not heavy enough to set them off, also the ground was frozen. When the Company came to ‘A’ Coy position they gave Alfie, who was a teetotaler, the company rum ration to carry. Somebody egged him on to drink some and Alfie was the worse for wear and shouting for the CSM. The ground, at this time, was frozen solid with permafrost and we were not allowed to wash our faces until after 10am when the sun made it a bit warmer. At night I used to ride shotgun on the Company jeep taking the sick and wounded back to the Regimental Aid Post. The driver of the jeep was Whitham he was 26 years old and I thought he was an old man. We had quite a few escapades, one night running into two tanks and getting lost on more than one occasion. During the day I used to walk on the path between the hills, across the valley taking messages for the Coy Commander, in full view of the Chinese who never bothered me. If anybody else or groups crossed this path in daylight they were mortared. The Coy Commander said I was the decoy and the Chinese recognised me because of my ginger hair. I had to stop crossing the path and cross lower down where I could not be seen and the others had to do the same. On this position HQ was on top of the hill and a sniper had a few goes at me and always missed. One of the lads got shot through the head by the sniper, his name was Pickles. One morning at first light CSM Harry Randall took me and a man called Hogg out in front of the Company position to inspect the wiring, when we got round the front a machine gun opened up on us and I threw myself down in the snow, as the firing kept on, after a while I got brave and looked up to see what the other two were doing and they were running through the snow back round the hill out of sight, me being just 19 years old soon caught them up, never mind the machine gun. One day round the back, at the bottom of the hill, I was burning rubbish and throwing bullets in the fire when Brigadier Kendrew appeared and told me off for causing smoke saying we would be mortared. Nothing much happened in that position after that, and the whole Commonwealth Division went into rest at the end of January. While we were in the rest area we drank a few beers, did some live firing exercises and watched Bill Silius demonstrate the bazooka by firing at a small hill, he missed it and the rocket exploded amongst friendly people, so the platoon took off over the hills out of sight. I was then sent on a two week cadre to be a L/Cpl, luckily I passed and then was put in rifle platoon No 7. When the spring thaw set in we were taken to the mobile showers, that was the first time I had taken my clothes off for three months, except for changing my socks. Going in the shower we took all our clothes off and just kept our boots on. Coming out at the other end we got sprayed with DDT and given clean clothes to put on. Shortly after we returned to the front line on Hill 146. It was a bit lively on this hill, which we took over from the Americans, we got dive bombed but the bombs missed everybody. One morning going for breakfast we got mortared and Bill Silius got hit in the back of the head. His mate Hank picked him up and shouted, “They have got my mate”, Hank was also hit in the back. We rushed through the mortar fire to help them, Bill Silius was disabled for the rest of his life, Hank’s wounds were only flesh wounds and he returned to us after a spell in hospital. After a while we were pulled off that hill, had about a week’s rest then went to the Hook. On the night we went to relieve the Black Watch the wagon I was in toppled into a river, there were about ten of us in the wagon and two got injured, one with a broken arm and one had a broken leg. The river was only about two foot deep and the eight of us went into the front line without any weapons and wet through, till the Black Watch gave us some dry clothes. The next morning we were taken to the river to get our weapons, and sleeping bags and take them back to the front line. We cleaned our weapons and waited till our sleeping bags had dried before we could sleep in them. While they were drying we got mortared and our sleeping bags looked like airtex. Our position on the Hook was at the top of the spur called ‘Long Finger’. At the bottom of ‘Long Finger’ the Chinese dug tunnels and caves to hide their troops in, ready to assault us. We were in this position from 12th May 1953 to the 29th or 30th May 1953. Every day or night we got shelled and mortared. Every night we went down ‘Long Finger’ on standing patrols, recce patrols, and on most nights we were mortared or ended up in a fire fight with the Chinese. One of the patrols I was on thought the Chinese had got behind us and we were going to open fire when we found out it was our own men doing wiring. Another time on patrol ‘Brown 32’ opened fire with his sten gun on our recce patrol, but luckily missed them both. Whilst on O/P one day I saw two Chinese on the hill opposite. I looked for the bren gun to shoot them but it was stripped down getting cleaned. I borrowed a rifle and put the sights to 1200 yds and fired two shots. They both missed but it made the Chinese run 1200 yds!, with the limits of the .303 rifle it was a waste of time shooting at that distance. Besides all these goings on the shelling and mortaring was intensifying, trying to weaken us before the big battle. In one hoochie a mortar bomb, or shell, went straight inside, leaving one dead, one with his foot blown off, one with both eardrums burst and one with his thigh sliced open. We had two more with buttocks and arm wounds so our platoon was six short before the battle, the Centurian tank that was with was hit but that stayed in action. We had been told all this was leading up to the Chinese attacking us. 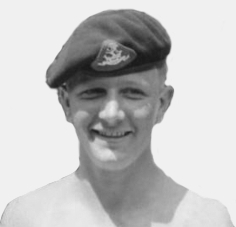 On the night of the battle it was very dark and drizzling, just as we were getting ready to go on stand to a massive barrage fell on us, Cpl Johnny Sargent shouted “Come on, the b–s are coming”. With that he led the way through the shelling to the firing pits, I was the last to go and got caught in the open by the next barrage. I could not see my way through this so, to my great shame, I laid down to die. When the shelling missed me, I got up and dashed through the bombardment and dashed into the firing pit, then I picked up a rifle and started firing down ‘Long Finger’ towards where the Chinese were grouping to attack us. After a short time the bren gun arrived. Zero Brown and I shared firing the bren down ‘Long Finger’ to where the Chinese were grouping for the rest of the battle. Shells and mortar bombs were hitting the firing pits and trenches all night long. I could not see down ‘Long Finger’, the cordite fumes were like a fog as they hung in the damp air. The hill we defended was like a lunar landscape, every 5ft trench destroyed and half of the firing pits. As we went to what was left of our hoochies at the back of the hill and started to clean our weapons Major Kavanagh came round and said “You are only boys, I hope you never have to go through that again”, there were tears in his eyes. I have been told 30,000 shells and mortar bombs fell on the Dukes position that night. The Chinese got into ‘D’ Coy at the side of us but none got into our trenches, we put down plenty of small arms fire to keep them away. Later that morning we were taken off the hill and went into a rest area where they gave us a good meal and we had a long sleep. The rest of the time in rest area was spent swimming in a river, getting our lost kit made up and getting reserves for the men we had lost. After a week we went back into the line in the Naechon Valley where we stayed till the war finished. While out on patrol one night in the Naechon Valley a Canadian patrol got caught by the Chinese and we could hear them crying for their mothers. We could hear them coming towards us so we prepared to take them on, but before they got to us the artillery opened up on them and not another sound came from them. We presumed they were all killed. After that things went quiet, just a bit of shelling and mortaring. We were told the ceasefire would be on the 27th of July 1953 at 2200 hrs. At 2200 hrs the last post was played and the war finished. We were given 48hrs to clear our ammo out and leave the front line. In this 48hrs the Chinese came out of their trenches and walked about. There looked to be hundreds of them, but we were not allowed out of our trenches to meet them. We were taken back behind the Imjin River, still inside the DMZ, and we made a large tented camp. We then started digging positions on Gloucester Hill overlooking the Imjin River, in case the war started again. We settled into normal army life, with a fair bit of sport, till it was time for the Battalion to go down to Pusan and wait for the ship to Gib. We were in Pusan about a week, where we went running on the beach and got drunk, and went to the UN Graveyard for a memorial service for the dead we were leaving behind. We left Britannia Camp and boarded HMS Asturius bound for Gibraltar. The ship called at Hong Kong, Singapore, Colombo and Aden. I think in each port we got drunk. On board ship there was an epidemic of dysentery. With dysentery, people are sick and have diarrhoea at the same time, so the combined toilet and washroom was a right mess. There were not enough toilets, so the lads were having to use the tiled floor. We stood with squeegees where you entered the toilets, when the ship dipped forward all the sick and mess came out of the toilets towards the sinks, we used to rush forward with our squeegees and push it all into the gulley at the edge of the washroom, then when the ship dipped backwards it all disappeared. There were 2000 servicemen on this ship, with whole companies sleeping on the same deck. They used to show films up on the open deck. At the rear of the ship was the crew’s quarters, which was out of bounds to us, some of the crew dressed as women and danced together, they attracted a bigger crowd than the films. On the troopship I was on duty as the ‘Canteen Corporal’ At 10:00hrs I had to clear the canteen, but when I went the sailors told me to ‘Clear off’ or I would end up as fish meat in the Indian Ocean. Luckily just then the Orderly Officer came with Cpl McKenzie and we cleared the canteen. Nobody argued with McKenzie – who had fought with World Champion Freddie Mills. When we got to Gib our Regimental Band played the ship in, and we marched behind the band to ‘Moorish Castle’, which was a bit of a shambles. We were told if we had £22 10s credit we could apply for Christmas leave, I applied. Our new Company Commander said “When do you get demobbed?” I said, “March 1954”, he said, “You go home soon enough”. I told him “I haven’t seen home since August 1952.” The reply was “You are going home soon enough, dismissed”, I was spitting blood. Gib was all guards, and more guards, and a bit of sport and getting drunk on Main Street in the Universal and Trocadero Bars. Every so often the British Med fleet came in for leave, then the American 6th Fleet, but never together. When they were in port the town was a bit more lively. We did a Guard of Honour on the dockside for the Spanish paying their respects to the Governor of Gib. On Christmas Eve I was Guard Corporal on Four Corner’s Guard at the Spanish Border, so of the two Christmases I was in the Army one, Christmas 1952, was spent on the front line and at Christmas 1953, I was on guard at Four Corners in Gib. When it came time for me to go home the CSM spent half a day trying to get me to sign on, saying I was a born soldier, I would not sign on. On my last guard duty at Moorish Castle one of the prisoners said, “Do you go home on Sunday?.” I said “yes”. He replied “I am going to run away so you will have to stay for a Court Martial. I am not taking orders from NCOs just coming out of England.” He and I had been in Korea together. I locked him in his cell, threw a bucket in to use as a toilet and would not let him out at all. The RPs let him out the next day. On the Sunday all the lads in the barrack room got up early to see me off to the airport and wish me all the best. We flew BEA to Blackbushe Airport in the South of England, it was the first time I had been in an aeroplane. We had to refuel in France, it took about six hours to fly to England in those days. We landed at Blackbushe late Sunday afternoon, got the train to London, and went to King’s Cross Station. The train for Huddersfield had just left and the next one was about 23:00hrs. There were about a dozen of us so we took our kit to the left luggage where the porter took it, and would not charge us for looking after it, it was the same on the tube train, they just waved us through the barriers without us having to get tickets. While waiting for the train we went looking for something to eat. A chap saw us and took us to a cheap cafe, then we went to the pub. The landlady played us all at darts for half-crown each, and beat us all. We got the train to Huddersfield, then to Halifax and slept all the way. On arriving very early morning at Halifax Station, I phoned the depot for transport for us to take us to the depot. Ernie Sharp answered the phone and told us there was no transport that early and we would have to get the first bus, which we did, I was in Korea with Ernie Sharp. When we got to the depot we went to the Guard Room and Ernie got us all a cup of tea. When the barracks came alive we went to the cookhouse for breakfast, the lads were nattering me to go to the company office for passes so we could go home. Going into the company office the L/Cpl Clerk was sat with his feet on the desk and he was reading a book I asked him for passes to go home. He told me to f— off as he had had a rough weekend, I grabbed him by the throat dragged him over the desk and told him I had had a rough two years. He then took us to the Officer in Charge, who was Lt Huxtable, he had been with me in Korea, in ‘C’ Company. He immediately gave us 7 day passes and sent us home. I went back after 7 days, got de-mobbed and left the depot without a thank-you or a goodbye. Lt Huxtable stayed in the army and ended up General in charge of all land forces in Britain. So ended my army service. When I got home I felt a complete stranger and it took a long time to settle down. This is a record of Robert Dawson’s, 2 years National Service in the Duke of Wellington’s Regiment. From the 6th of March 1952 to March 1954. Interviewed by Tracy Craggs Regimental Archives Dept, Audio Archivist.